Description: Slightly changed postwork filters to achieve more "drawing" look.. Essentially the effext is that of a high pass filter - or sharpening filter. 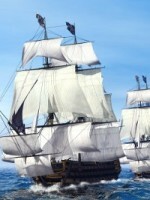 The sails of the ships gained resolution, I like that. But for the sea, it's a little bit overdone. Ok, you wanted to give this a bit of a "drawing" look. I wonder how it would look if you rendered this scene in premium with 64 rays per pixel. Overall, I like the other one better, even though the sails look better here.